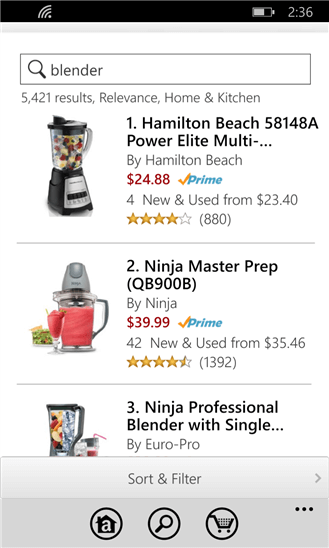 This morning the Amazon app for Windows Phone received a minor update that has brought stability and performance improvements to the shopping app. The update, version 2.6.81.2 for those keeping score, only lists “bug fixes and performance improvements” in the release notes as what is new in this version. However, I for one, had significant issues using this app prior to this update with it often crashing on me as I was searching for products. This morning at least those seem to have gone away. includes all of your Amazon Prime shipping options if you are a member and you can search around the world with this one app (one download regionalized). One feature that many brick-and-mortar stores won’t like is the bar code scanner feature. If you allow the Amazon app to have access to your camera, you can scan a bar code in a store and it will do a comparison price of that product on Amazon. The Amazon app for Windows Phone is free and available in the Windows Phone Store.